When Euclid wrote about ratios of lengths and areas and similarity, without algebra, theorems were dependent on spatial representations. 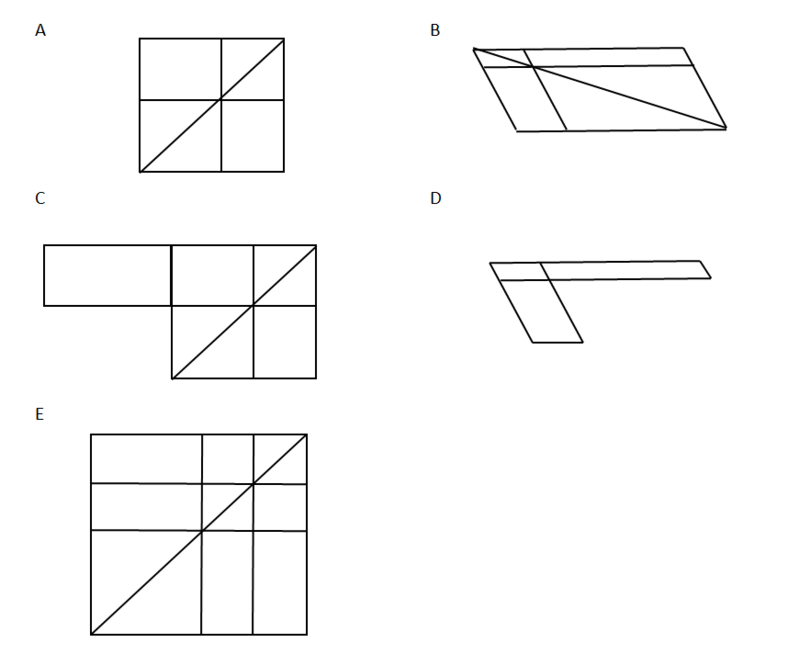 Five diagrams, all related to each other, appear in his text in various places, so I designed a ‘Match the theorem’ task in the manner of Malcolm Swan’s tasks. There isn’t a one-to-one correspondence and you may have to draw some new diagrams (typical of Malcolm’s card matching tasks). I have used language from the versions of Euclid by Todhunter and Heath, but have also elaborated in my own language – thinking sometimes that I can do a better job (arrogant!). The phrase ‘about the diameter’ can be deciphered from the text and diagrams. The diagrams could also be used for: ‘say what you see, and can derive, in this diagram’. Equal parallelograms which have one angle of the one equal to one angle of the other, have their sides about the equal angles reciprocally proportional; and conversely parallelograms which have one angle of the one equal to one angle of the other, and their sides about the equal angles reciprocally proportional, are equal to one another (n.b. ‘equal’ here means ‘equal area’). If two similar parallelograms have a common angle, and be similarly situated, they are about the same diameter (that means diagonal). You can imagine that I was delighted to find the following ‘Further exploration’ suggestion in Jemma Sherwood’s new book: How to enhance your mathematics subject knowledge. So this is good news for my sanity – two other people, Descartes and Jemma Sherwood, also think that Euclid could still be a source of some searching ideas about number and spatial relationships. You can probably see the danger here: we have all encountered teaching that goes straight for the abstract ‘change the side, change the sign’ but Jemma is not advocating that. Throughout the book she describes journeys through numerical and spatial meaning, representations, the meaning of the mathematical actions we do in particular representations, and the need to – eventually – wean students away from depending on a limited image. As well as this she contextualises core mathematical ideas into both the history and advanced issues of the subject expressed in accessible ways that could be adapted for school use. When I look at any maths text intended for school level I look at two areas: proportionality and functions. This is because they are crucial in later understanding and often introduced in over-simplified, fragmented ways (and sometimes using wrong mathematics!) Ratio, scaling and proportion get twenty pages of Jemma’s book spanning counted bead patterns, rational number, rates of change, gradients, formulation and a segue into continued fractions. pa < qb and pc < qd simultaneously. In other words, we are comparing to and hence to and this tells us something about equal and unequal ratios, with multiplicative relationships as the focus of attention. Note how hard it is to read this, even when you are very confident and fluent with proportionality. These relationships are taken for granted in our modern use of proportionality with the benefit of algebra and graphs to demonstrate it. Jemma says, in this context: ‘One of our responsibilities is to make explicit the things we take for granted’. It isn’t a surprise to find that her twenty pages do not start with this approach, but instead she offers a sequence of ways to represent the family of multiplicative relationships involved in understanding proportionality, usually using scaling as the basic idea. I wish I had started my teaching with this book. You can view it on OUP’s site. This is brilliantly thought-provoking, thanks Anne – I got as far as equating diagram A with theorem 2, but even that took me a while. I also learnt that 5pm on a Friday afternoon is probably not my optimum time to math. Need to ruminate and caffeinate further.